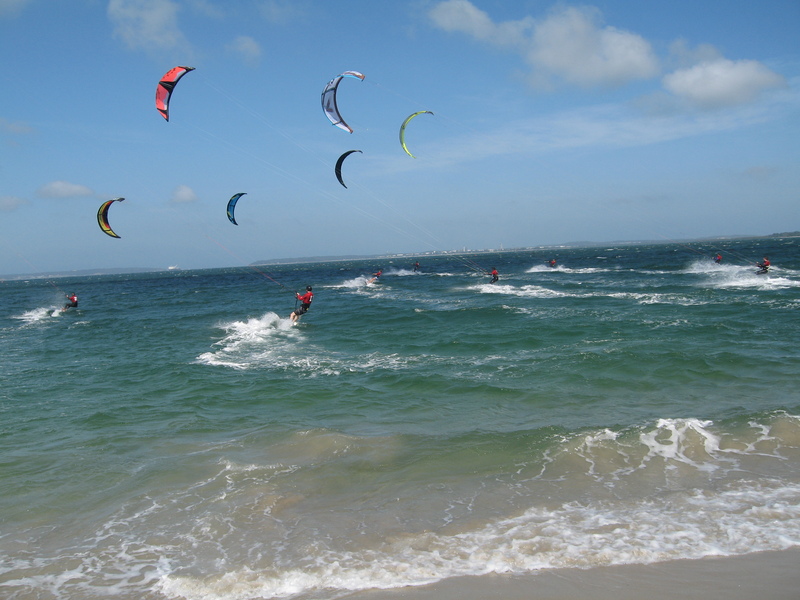 This coming weekend sees me down at Botany Bay for Round 2 of the Kite Boarding racing on Saturday. Given the conditions will be similar to a couple of weeks back, I now know what to expect. Hopefully there’ll be more coming to race now that the word is out. Sunday is the NSW Boating Industry’s Try Sailing Day. Normally I go down to MHYC, however this time I’m going to do the rounds of the Central Coast clubs. Hopefully I’ll get around to Gosford Sailing Club, Budgewoi Sailing Club, Mannering Park and South Lake Macquarie clubs up on Lake Macquarie, only one I’ve sailed from before. So some time back those at the International SailingFederation [ISAF] decided that the sport of Windsurfing.sailboarding would be dropped from the Olympic games for RIO 2016. In it’s place would be Kiteboarding. Whilst I know a few who Kiteboard, I’ve had little experience with it. As a teenager, I dropped out of sailing for a while and bought a couple of Windsurfers and competed in a few regattas, went wave jumping on Sydneys Northern beaches and even ventured up to the Central Coast on occasion. There are those who are yet to come to grips with either as a sport relating to Sailing, but as they are all powered by wind, I won’t get in to an arguement on the minor technicalities. So the other day I was looking at http://www.seabreeze.com.au an excellent Australian weather website and noticed that there was a Kite event on at Botany Bay being organised by one of DeckHardware’s customers, Kite Power. I had a look at the link and realised that whilst they are a new group to racing, what better way as a Yachting Australia Race Official than to get involved, especially with RIO 2016 in mind. I got in touch with Steve McCormack and offered my services and arranged a meeting. Steve eagerly accepted my offer as an RO, so there I was on Saturday at my first event. They had over 30 competitors in two divisions, race and off the beach. As a RO setting the course was easy, the hard thing was how do you identify them? Kite Power had arranged numbered T shirts so that was easy, but a little harder than I thought. I was helped out by Evelyn who knew most of the competitors, all I had to do was train her in the art of Race management and we were off. We got in two races in each division in around 18-20 knots of breeze, perfect conditions for the flyers. As we went in to sequence for race 3 in the racers, one competitor Jordan Girdis noted that the breeze had increased some what. We hoisted the AP [Answering Pennant] and did a spot of checking with the local windstations and the use of my JDC Eole. Yes the breeze had got up somewhat and was more survival that good racing. After a 3/4hr postponement we agreed to pull the pin on the day. The competitors were a mix of sailors including Jordan who had just competed in the recent Melges24 Worlds in San Francisco and Aiden Menzies a former crewmate of Nathan Outteridge. It was good to see them all mixing and talking about the different equipment. Certainly an eye opener for me with no previous experience with Kite Boarding. These guys were also acceptable to having a national race official coming in from the outside to make things run smoothly. The comradery was excellent with a BBQ running, Getto Blaster sounding out the tunes on the beach, it was all about atmosphere and it helped to set the scene. I’d like to say thanks to Steve and Evelyn and the rest of the team who helped run the event, none of whom I’d met until that morning. I certainly look forward to the next event and helping out those who are looking to compete at Sail Melbourne later in the year where I have put up my hand to help as an RO. These guys certainly have the enthusiasm for their sport and made for a great day. Next time I hope ‘Hughie’ the wind god plays nice and we get a good NorEaster. After many years of involvement in competing in and then running the Heaven can Wait 24 hour race around Lake Macquarie over the October long weekend it was time for a little change of scenery. To the other side! I put my hand up several months ago to help run the NSW Youth Championships, not really knowing what I was in for. There were two courses, I was the Race Official on Bravo and Jeremy Atkinson from Woollahra was on Alpha. I had 29ers, 420s, Laser radials and 4.7s and the largest fleet in the Flying Elevens. Overall there were some 200 boats and 275 competitors. I was fortunate to have my daughter Melissa once again backing me up on the start boat looking after the clock, she usually avoids most race management with me except for the Rolex Sydney Hobart race, preferring to do her own. Rhys Llewellen a DeckHardware Ambassador parent came from Narrabeen Lakes Sailing Club to do the flags. I was extremely fortunate to have another MHYC member in John Winchester offering his time to lay all the marks of my trapezoid course. Having these three with me made the three days and fifty starts [plus generals!] a lot easier. I didn’t have to worry about anything happening behind me, all went to plan. Rhys also took care each day in picking up the radios and trackers and returning them upon returning to the shore, John had to load and unload his boat daily with 5 marks. I think I had it easy worrying about the weather and the course to set. Saturday dawned with a forecast of strong winds, we were not disappointed! The sailors came out and were greeted with gusts to 30 knots, a decision was made to send them ashore to wait it out. After several hours and the breeze reaching 35 knots on occasion it dropped down to a more manageable 18-20 and we were able to get in 2 races before sunset. Sunday was a total change as Hughie definitely disappeared overnight. This time the land breeze took several hours to rotate around to a nice seabreeze of 10-12 knots, perfect. Even though most of the sailors were out there all day, we managed to get in 4 races. I’m sure that there were plenty of exhausted youth sailors that night, I know of a couple who were asleep early. Monday was the same as the day before, except this time we kept them all ashore till the seabreeze arrived. We were fortunate to get in the required number of races after the gear breaking conditions of Saturday, there were several masts broken in the F11s and Lasers. As for the results, I’ll leave that to the NSW Yachting website. What was notable was the number of ‘repeat offenders’ starting at our end of the line each time, the start team had a repour with some, “he’s back…”. There was one female Laser sailor who had the boys bluffed; she certainly nailed the start on more than one occasion. It was also nice seeing those who did timed runs in from the port end working out the line bias. What disappointed me most was the total disregard by many parents and coaches in Sailing Instruction 25 requiring them to stay 50m away from the course area. This is one point that has been duly noted the next time I run a Youth Event. Jeremy said that he could almost have spent the night in the protest room blowing out his Alpha fleet, but decided against it too. Next year? Maybe time to go sailing again in the HCW.